Ah, it’s time for the annual roasting of the iFad and all it’s non-glory (see- No, I’m not the first one to call it an iFad & Dare I Call it iFad 2?). To be fair, last year I did end my rant stating that I believe the iPad is cool. For that reason alone I believe people are buying them. Is there utility in them? Sure. Everyone operates differently. I enjoy using a real keyboard and navigating websites and videos without error messages. I also enjoy quick glances at my phone to check messages or social networks. And finally, I enjoy unplugging every now and then. To me the iPad would only solve 2 vacancies in my tech life. 1. Notebooks – I’m intrigued at the idea of organizing meeting notes into one place. In recent years this has become even more of an issue due to mixed responsibilities for multiple businesses and projects. +1 to tablets for helping to manage this through cool apps. $499 (minimum) to do this doesn’t meet the ROI for me though. 2. Mobile Slides/Presentations – I’ve found myself wanting to share a website or show some examples of something more and more on my phone in the past few years, but that has its limitations. Using Keynote or having the ability to quickly show off a webpage on a much larger screen can be helpful, and the ease of use compared to a laptop is a nice convenience. Downside to showing a web page is the need for WiFi or an extra data bill my boss isn’t going to pay for (and I’m sure not going to either). 1. Email & Calendar – Another place to sync Outlook & Google account just in case my computer’s in my bag/car/other room and/or I’m charging my phone. 2. Separating Work & Leisure – While taking notes on a tablet would be nice for work, I think I would find myself utilizing it more for leisure (reading, web browsing, & social media). I kind of like the idea of separating work and play a bit to different devices. Ahh, who am I kidding? My work/life balance with technology is a train wreck. Other than that it’s really more of a distraction and frustration for me. 1. Another device to keep track of, charge, update, and manage. 2. Another reason for me to stay plugged in all the time. 3. Another item to trouble shoot when it’s not working. 4. Another gadget that I’ll feel outdated carrying 1-2 years from now. So, some potential upsides and potential downsides. As time goes by I do feel like the tech nerd not on the bandwagon, but I just can’t justify the price tag for this luxury. It’s definitely a luxury item. I’m a golfer and I compare it to buying a new set of irons. I’d sure really like to get a new set, but the ones I have work and the features of new ones don’t really justify an upgrade. Of course, like a new set of irons, if given an iPad as a gift I’d embrace it wholeheartedly. 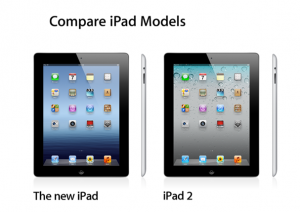 I will say that the upgrades for the “new” iPad weren’t overly impressive, but it is nice they kept the price the same and lowered the cost of the iPad 2. So…maybe there’s a tablet in my future, but overall they have a long way to go before they replace my computer or fill any significant gaps in my nerdiness.